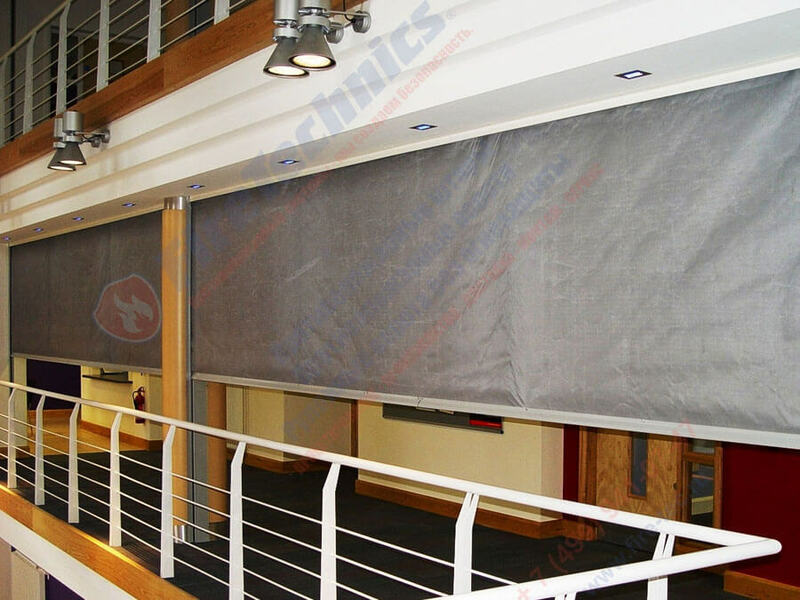 Fire-resistant automatic curtains of the type FireTechnics (Fireshield) EI60; EI90; EI120 (without irrigation with water) from the manufacturer, are intended to divide the rooms into separate fire compartments and prevent the spread of fire throughout the building, thereby protecting people and property from the effects of fire and smoke. When an alarm is triggered, the curtain is lowered due to the drive system Gravigen – no power, under the action of gravity the bottom bracket. The lowering speed is 0.15 m/s In the case of the power failure the system retains functionality within 72 hours with a control unit built-in battery. To obtain high durability when exposed to high temperatures within each fiberglass thread interwoven with thin stainless steel wire. The inner layer of the leaf consists of thermosetting composite materials, which at 160-180 degrees Celsius expands to 50 mm and provide protection from heat flow. The fabric is certified as non-flammable and non-toxic. Consists of three roll-formed, galvanized sheet steel 1.5 mm panel length up to 3 m For building long curtains, panels stacked together. Both ends of the casing are closed with covers, which tightly close the circuit. The side covers also serve for the perception of torque tubular motor. The dimensions of the box depend on the height of the cover openings. For accurate sizes please contact the managers of the company FireTechnics, depending on Your needs we can manufacture fire curtains custom. Intended for the direction of the fabric unwinding from the shaft. Made of sheet steel 2 mm thick (casing — 1.5 mm). the guide needs to be absolutely smooth without Burr. Important! fireproof curtain type FireTechnics (Fireshield) EI60; EI90; EI120 (without irrigation water) are delivered to the object is almost assembled, which greatly facilitates the installation of fire curtains, increases the speed and correctness of execution of mounting and commissioning works. Are intended for a direction of a cloth at unwinding from a shaft. Made of sheet steel 2 mm thick (casing – 1.5 mm). Guides should be absolutely smooth without burrs. Color execution: any color according to RAL color scale or galvanized steel. Fire may occur due to any carelessness, electrical failure, or network congestion. In the event of a sudden occurrence of fire in any commercial, public or industrial building, the main task is to prevent the spread of flame and carbon monoxide throughout its area, threatening the safety of people in it, and also capable of provoking property damage and material assets. And roll fire curtains to minimize harm in the event of an outbreak – one of the most effective means. These fire safety elements are used to divide the interior spaces into separate segments. They are especially important for large buildings, because on large open areas the fire spreads extremely quickly. Splitting them into separate segments through protective partitions makes it possible to localize the fire, to prevent smoke spread and, as a result, to reduce the possible damage and threat to human lives. They reliably localize the burning site, not allowing its products to spread beyond the fenced area for an hour or more. At the same time they provide free access to the infected area to firemen, and also do not interfere with evacuation. Typically, such products are made in the form of a shaft with a wound web, which is a protective housing made of steel. When the machine starts, the canvas starts to unfold under its own weight, as well as the mass of the cutting part that is at the very bottom, blocking the opening. Painted with epoxy-polyester composition in any color of the RAL table. The principle of functioning of such fire-preventing barriers lies in the interaction of thermal sensors, a drive and a system of electromagnets. The latter are connected to thermal sensors, which, in case of ignition, respond to an increase in temperature by sending a signal to the electromagnetic system. Disconnection of electromagnets provokes lowering of the blade. 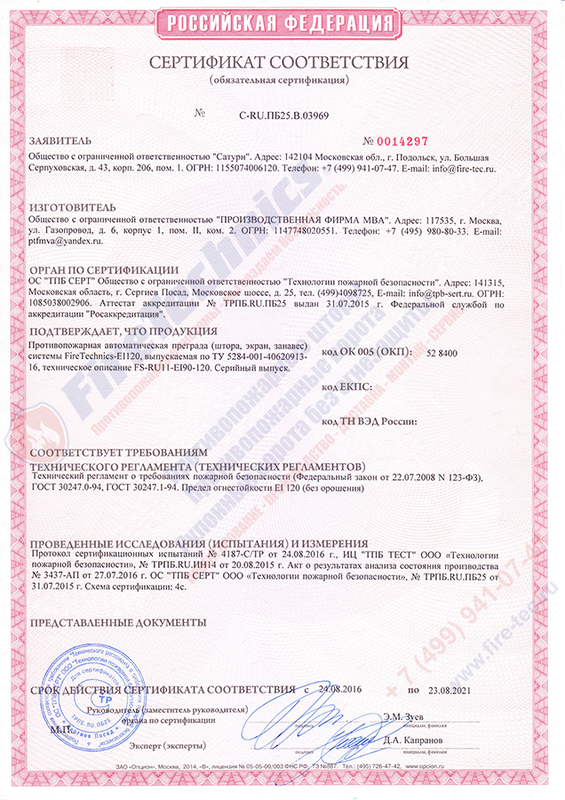 Gathering buy fireproof curtains, you should know that they are delineated into two large categories E and EI. The latter includes more robust and fire-resistant structures in comparison with the first, to which the products consisting of one or two layers of specialized fabric belong. With different fire resistance limits – EI 60, EI 120, EI 180. 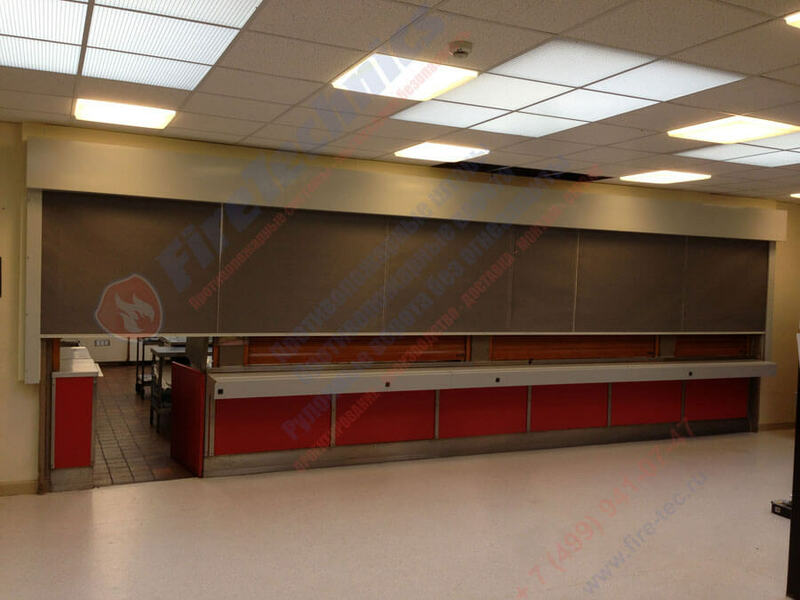 Numerical designations are the most important parameters that affect the fire curtains cost. The first letter -E – shows the time of preservation of the whole barrier when the products of combustion are exposed to it. 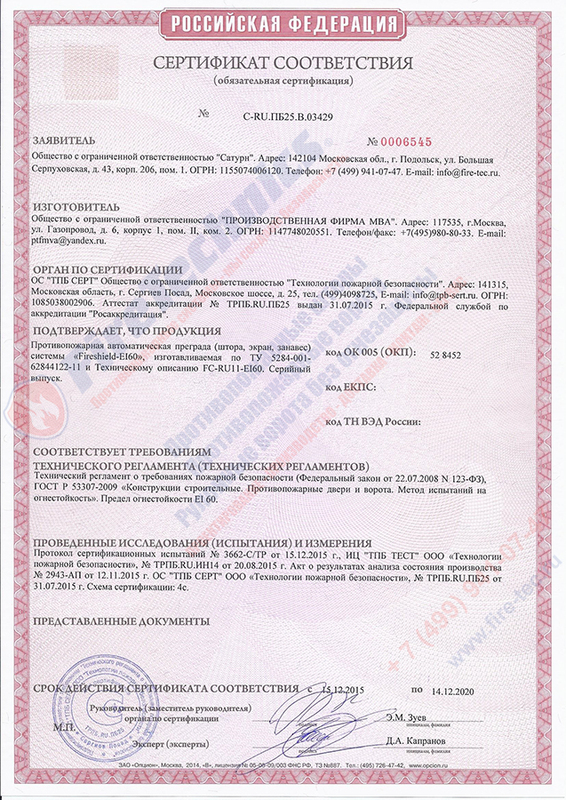 The second letter – I – indicates the time interval at which the protective screen is able to delay the penetration of heat into the room protected by it. They are both measured in minutes. The number in the code says about what minimal time period the canvas can withstand the onslaught of the fiery element. 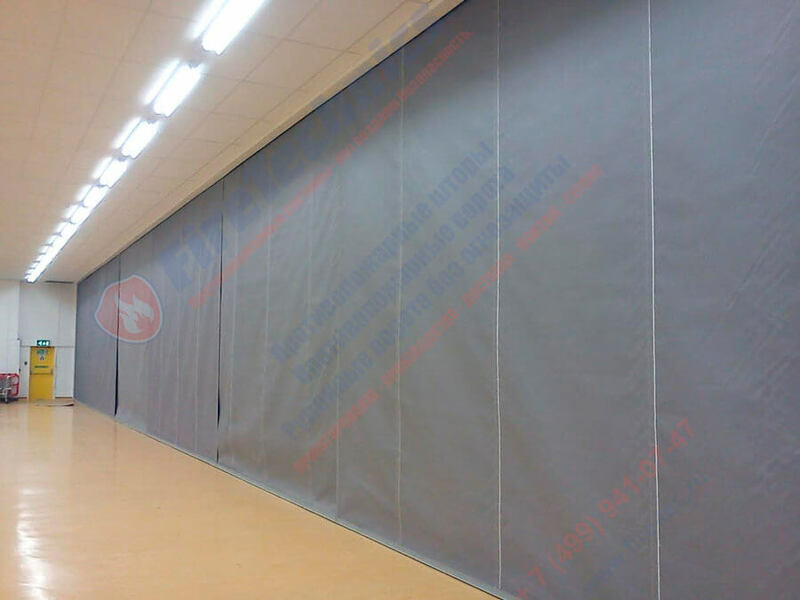 Fire curtain EI 60 Can be called the most popular option because of a reasonable ratio of quality and product prices. Since the EI 30 fire curtain with a flame retardant limit of 30 minutes does not always allow a safe evacuation and wait for firefighters to arrive. Protective screens with a fire resistance of about 120 and 180 minutes are usually installed together with an irrigation system (usually one-way, with a flow rate of at least 6.8 liters per minute * m2). Despite the optimal fire resistance of the EI 60 blind, in practice it is often necessary to mount air curtains with a longer protection – EI 90 or even EI 120, which is provided by high-quality products from FireTechnics. 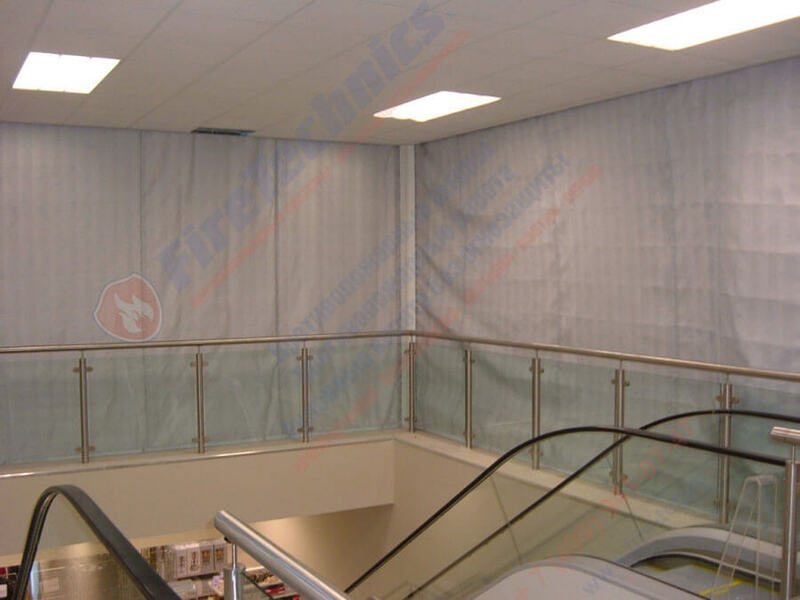 These Fireproof curtains from the manufacturer can be used both independently and together with other elements of the fire safety system of this company. For example, together with smoke curtains and forced ventilation. 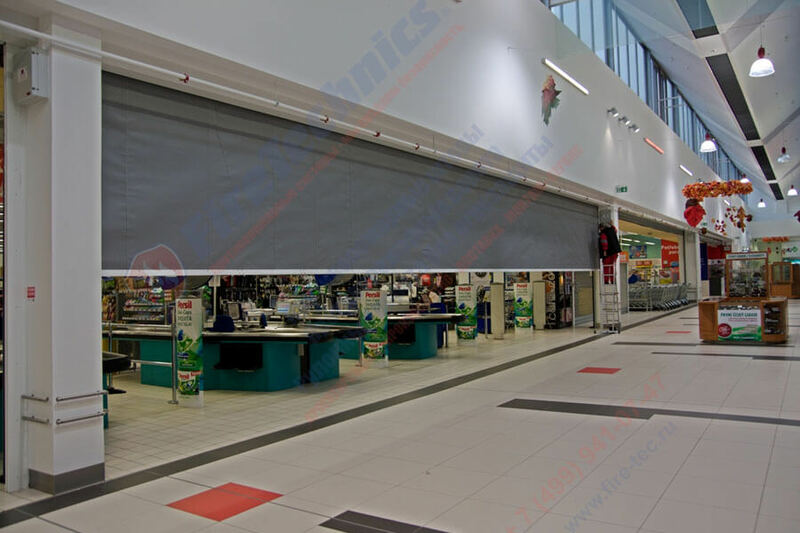 LCC FireTechnics – Leader in the modern market of automatic fire safety systems – offers consumers attention Fire curtains EI60, EI90, EI120 (without water irrigation), which have a high level of fire protection. At the onset of fire danger, they will effectively divide the room into compartments and prevent the spread of flames, heat and smoke throughout the building, protecting people, property and values from their harmful effects. 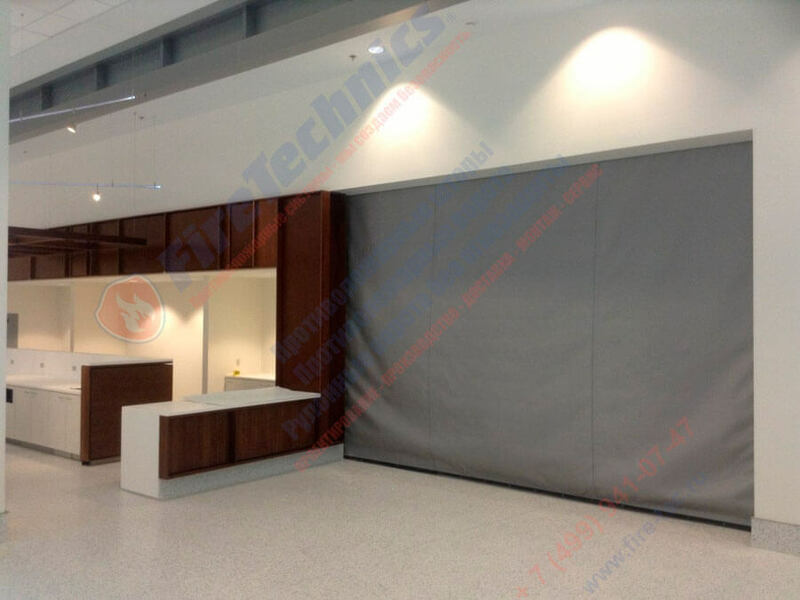 Fireshield fire curtain It is based on a 3-layer non-toxic, absolutely incombustible sheet, additionally reinforced with steel mesh. It is necessary so that the fabric does not tear under its own weight, and it is also more resistant to destructive fire effects. With a large area of the obstructed opening cloth fireproof curtains Is assembled from several “pieces” that are connected together during the installation. 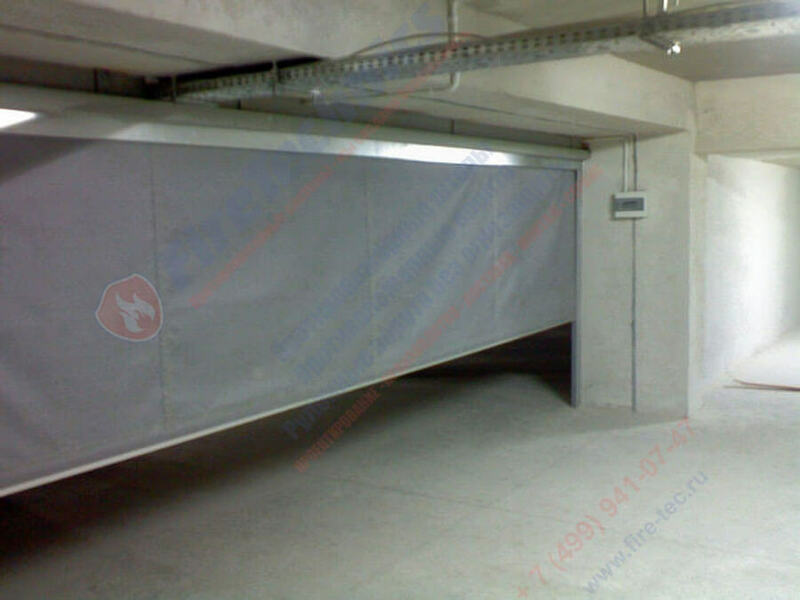 Thanks to this fireshield curtains are effectively used to block even very impressive openings. At the request of customers in the construction of barriers can be equipped with lasers (so-called door-loopholes) that facilitate the evacuation of people. 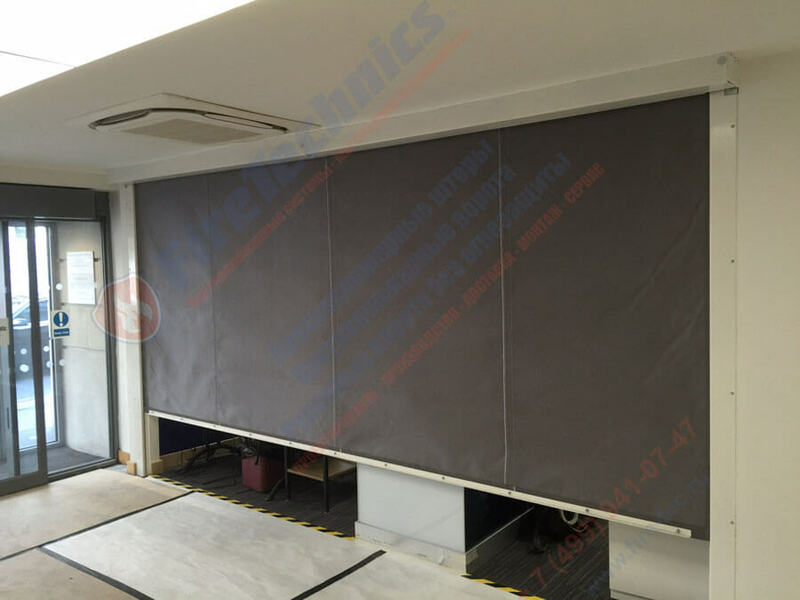 Installation of fire curtains FireTechnics Is carried out in a box consisting of steel curved 1.5-mm panels (three pieces), whose length can reach three meters. If there is a need to create long curtains, the panels are joined with each other. Both body ends are closed with covers, hermetically closing the circuit. In addition, the side covers are also designed to perceive the torque of the motor when controlling the fire curtains. The exact dimensions of the box are determined by the height of the opening, which they overlap. 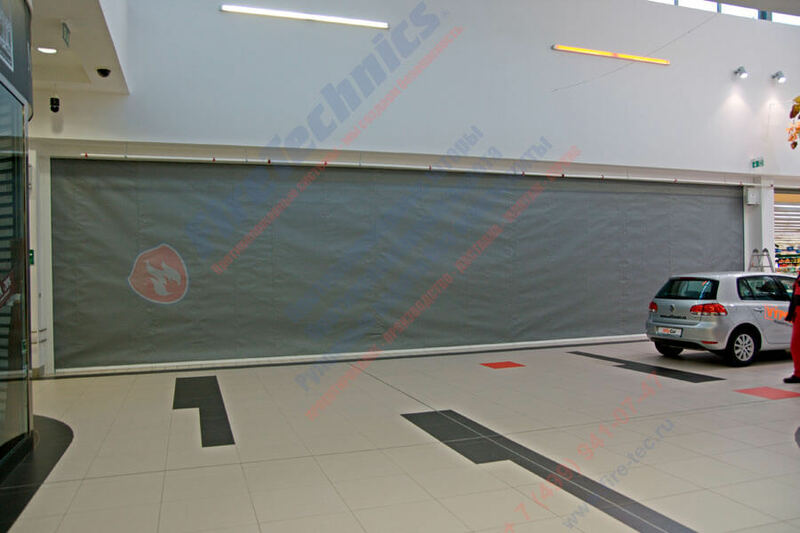 To order Manufacture of fire curtains, their installation and subsequent maintenance you can in the company FireTechnics. Such a reasonable solution will give you the opportunity not to worry about the consequences of the sudden occurrence of a fire in your building and to work with confidence in tomorrow. 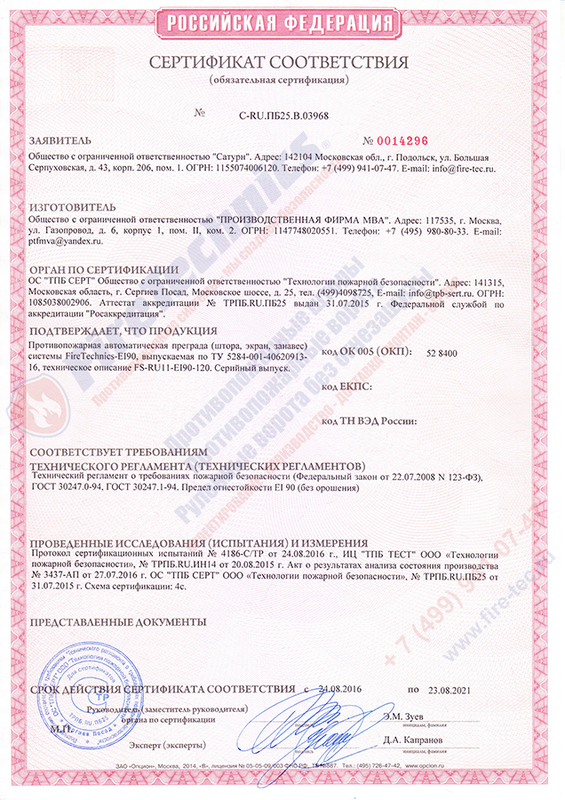 Hot shops where explosive and flammable materials and substances are used. 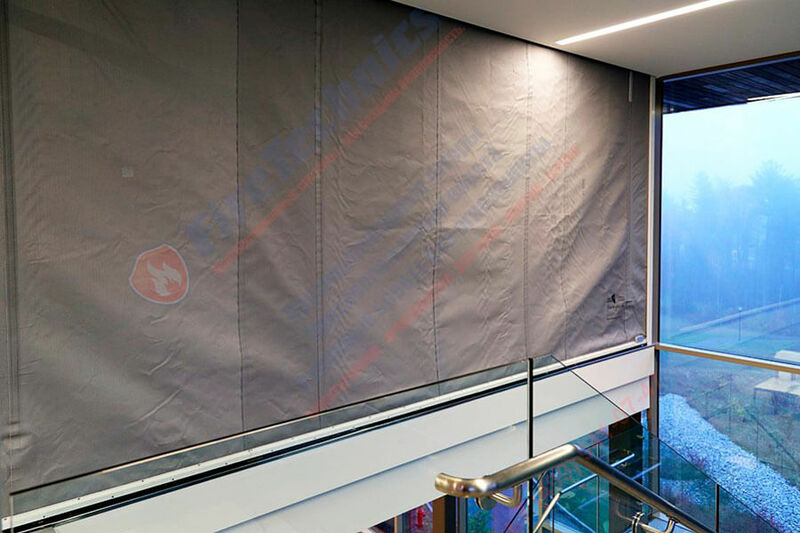 As prescribed by the instruction of fire curtains, they are not only tasked with cutting off the source of ignition from the other building area, but also preventing the spread of smoke and other combustion products that are no less dangerous than the fire itself. When the alarm signal is given, the Fireshield shutters are immediately lowered by the Gravigen drive system under the influence of gravity acting on the lower bar. The product is lowered at a speed of about 0.15 m / s. If you turn off the power supply, you should not be afraid of the reliability of the system’s operation in case of fire – the built-in battery’s capacity is sufficient to maintain its functionality for the next 72 hours. The installation of fireproof curtains is not necessarily indoors, but also to protect the facades of various structures. In this respect, they are substitutes for full-fledged fireproof windows. Since the requirements of the law require them to be “not opening up,” their exploitation promises many inconveniences, such as the impossibility of washing or airing. The installation of air curtains helps to solve the problem with fire safety, not incurring inconveniences in the future use. 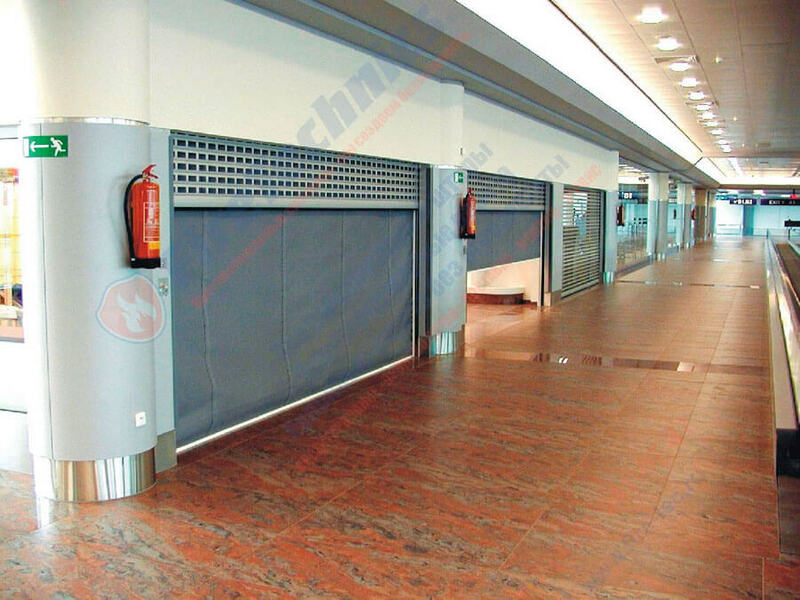 Thus, fire curtains EI 60, the price of which in our company is very affordable, in some cases become indispensable for outdoor use. Their high technical characteristics and performance characteristics allow them to compete with fireproof doors and various partitions. Service maintenance of fireproof systems. When there are questions that affect the choice, acquisition, installation of fire curtains and them service, call or email our managers. You will receive exhaustive answers, if you want, you can make an order, and within a month your facility will already be equipped with a reliable, stylishly looking, inexpensive and long-lasting fire safety system!